The Irish Wolfhound Health Group published their latest Newsletter last month. It’s full of information about the breed we love, the Irish Wolfhound. You can sign up on their website to receive the Newsletter directly into your email inbox each time it’s published. Also, check out the website – whether you are an experienced owner with many years under your belt or never owned a wolfhound and just doing your research because you’re interested in getting a puppy, there is plenty of information there for you. The Kennel Club is developing Breed Health and Conservation Plans (BHCPs) for all registered dog breeds to ensure that health concerns are identified through evidence-based criteria. This will ensure breeders have useful information and resources to support them in making balanced breeding decisions in the future. Irish Wolfhounds are in the next round of breeds identified by the KC for this project so we are inviting ALL OWNERS to complete this simple survey, to provide the KC with an up to date and accurate snapshot of the breed’s current health status. The survey is anonymous and your answers, along with other sources of scientific evidence, will provide important data for our BHCP. It’s Nearly Time for the Gaitherin’! It’s nearly time for our annual Gaitherin’ and we hope you can join us!! Come along to Cochrane Hall at Alva on 15th July for a fun-filled day, with friends old and new, enjoy a fabulous lunch and maybe win a prize or two! A few members and friends gathered on 23rd June for our regular walk at Scolty Hill in Aberdeenshire. We started early to avoid the heat of the day and also the crowds as it’s a very popular venue. 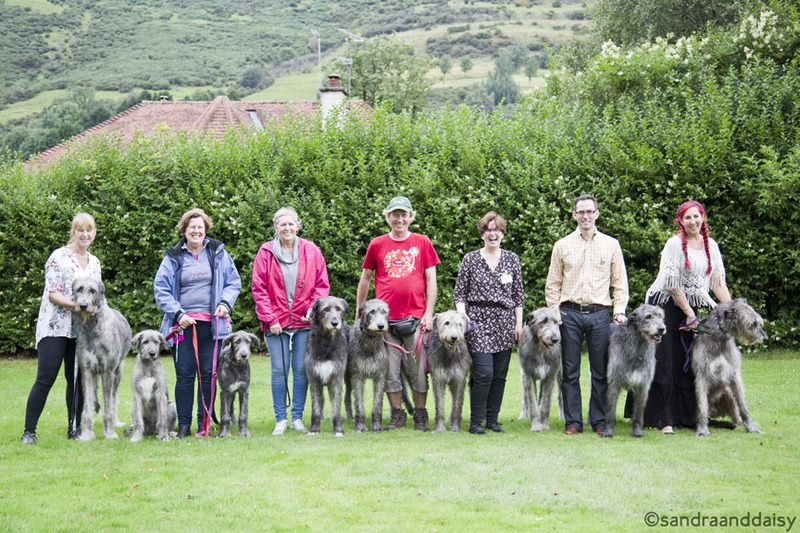 There were 12 wolfhounds in the group, all wonderfully behaved and super ambassadors for the breed. Hope to see you all at the next one. It’s not easy to get everyone looking at the camera!